The 850 metre long Pamplona bull run route winds its way through the tortuous medieval streets of the Old Part of the city. Due to the complex urbanism of this area of Pamplona, the fruit of centuries of building work contained within the city walls, the route features steep slopes, double right angle bends, narrow, shady streets, and there is even a tunnel at the end, leading into the bullring. In other words, the whole route appears to have been designed to form a varied, breathtaking run. Yet, in actual fact, the route layout is by pure chance, responding to the location of the former city walls, the medieval gateways into the city and the situation of the bullring.. The first section of the bull run is 280 metres long, featuring a steep slope with a gradient of up to 10%, and part of the street is boxed in between vertical stone walls. The bulls run out of a pen situated in a former bastion in the ramparts. This is a section in which the bulls run the fastest, as they are fresh and ready to run, and it is far easier for them to run uphill since their front legs are shorter than their back ones. The most famous street in the bull run is 300 metres long, shady, and with a slight upwards slope of 2%. It has a spectacular start with a 90º right angle bend; the centrifugal force causes the bulls to impact against the outer fencing, fall over and become separated from the herd. This is the final section of the route, the brightest and the only one with a gentle slope downwards. 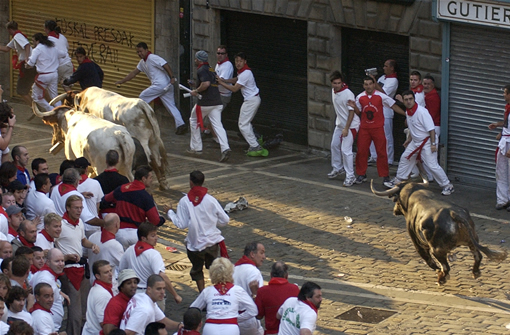 Here the bulls are tired and run slower than at the beginning of the run, crossing a zone free from buildings and with fencing on either side. This section is 120 metres long with a width of 9 metres at the start and which gradually narrows down to form a bottleneck of 3.5 metres in the passageway and 25 metre long tunnel leading to the last 50 metres in the Pamplona bullring.